Welcome to our holiday apartments! 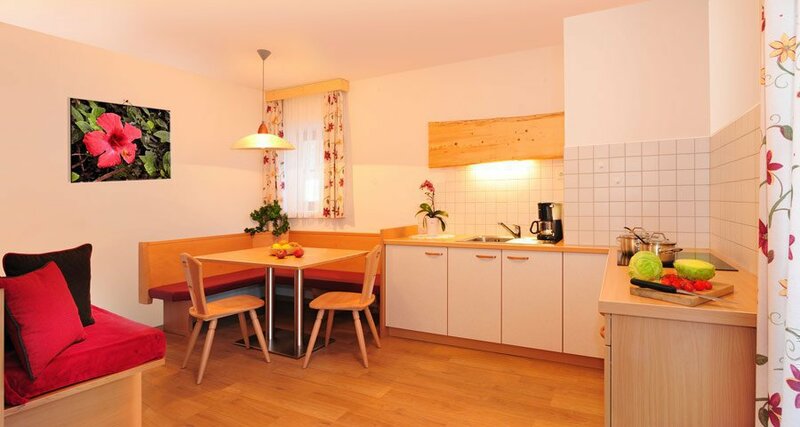 The spacious apartments are fully furnished, and you will find everything you need for a pleasant farm holiday. All apartments have a balcony with great views over the Val d’Isarco. 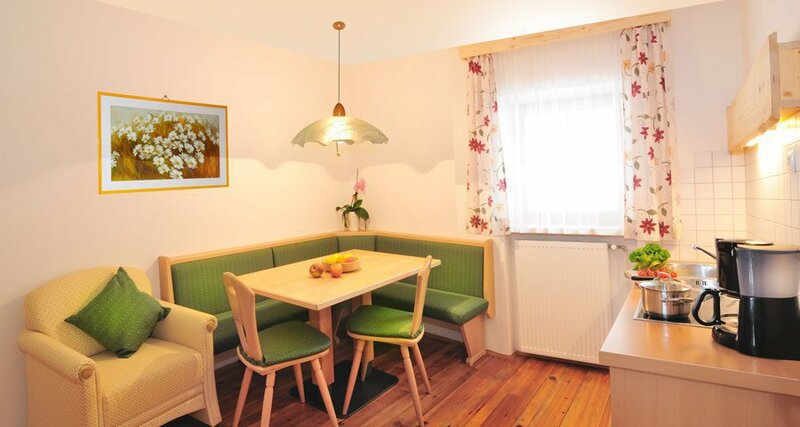 We have 3 cosy and spacious holiday apartments for 2-5 persons. On request, you may also combine your apartment with an additional multiple room. Bed linen, bath towels, and kitchen towels are also available. We are happy to offer a bread delivery service. The local baker will deliver fresh bread to your door early in the morning. Your host Sonja will pamper you with a sumptuous farm breakfast in the lounge or bring a breakfast basket with fresh pastries, homemade jam and juices, bacon, fresh eggs, and milk to your front door. 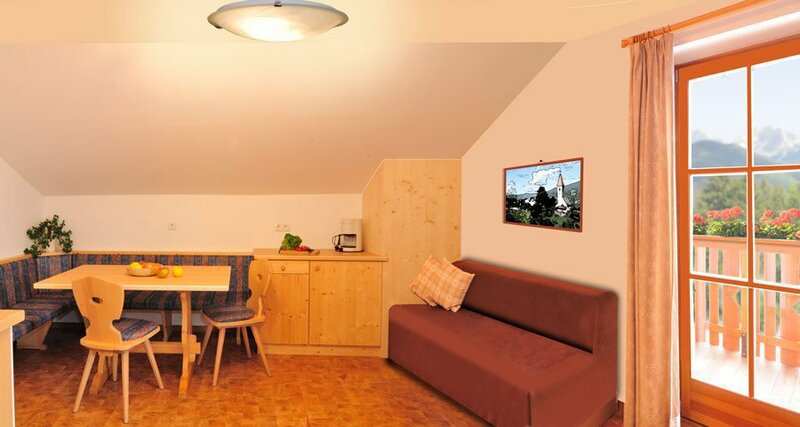 The holiday apartment “Dolomites” offers approx. 60m2 and offers space for 4-5 persons. 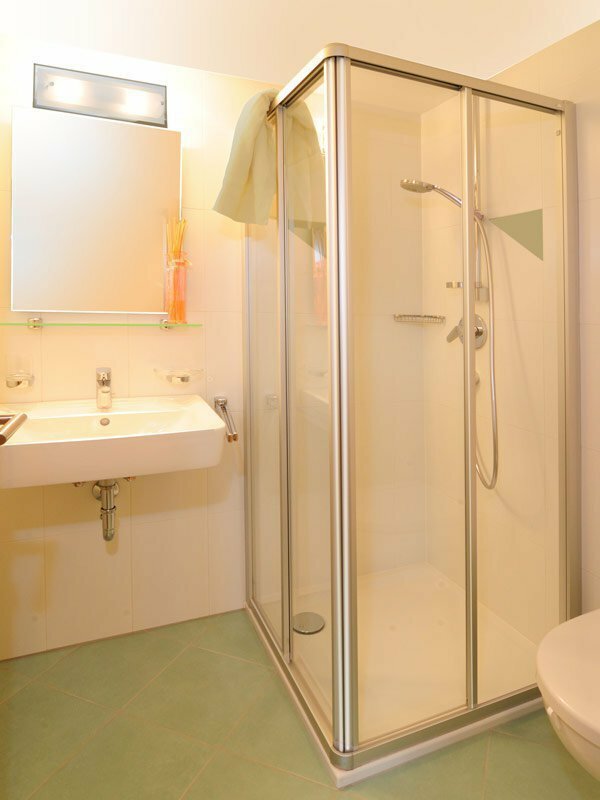 Bathroom with shower, WC, bidet, hairdryer, board game collection. 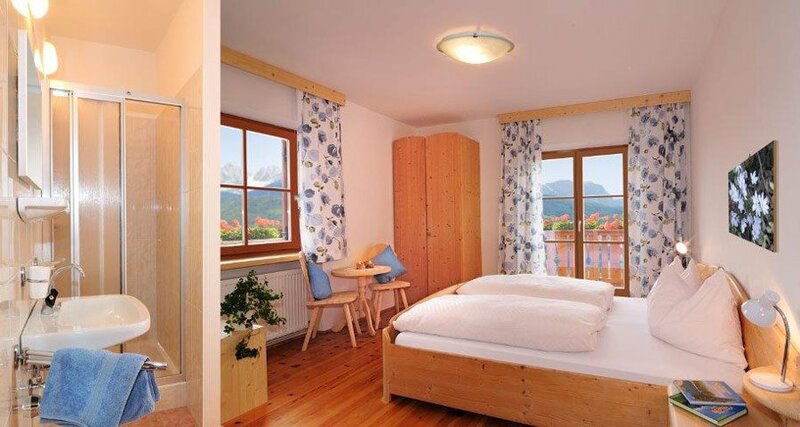 The sunny and large balcony, which faces south-east, offers a wonderful view of the Dolomites. you may enjoy a farm breakfast in our farm lounge. The holiday apartment “Sciliar” offers approx. 55 m2 and offers space for 4-5 persons. 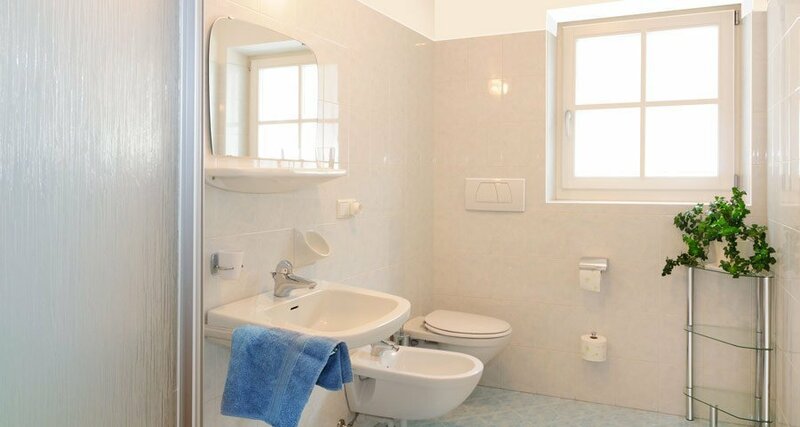 Bathroom with bathtub, WC, bidet, hairdryer, board game collection. 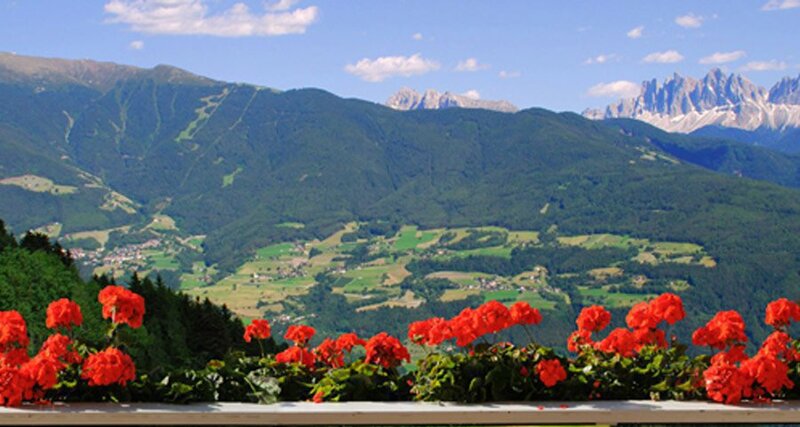 The sunny balcony, which faces south-east, offers a wonderful view of the Dolomites. The holiday apartment “Plose offers approx. 45 m2and offers space for 2-3 persons. The sunny balcony, which faces east, offers a wonderful view of the Dolomites. 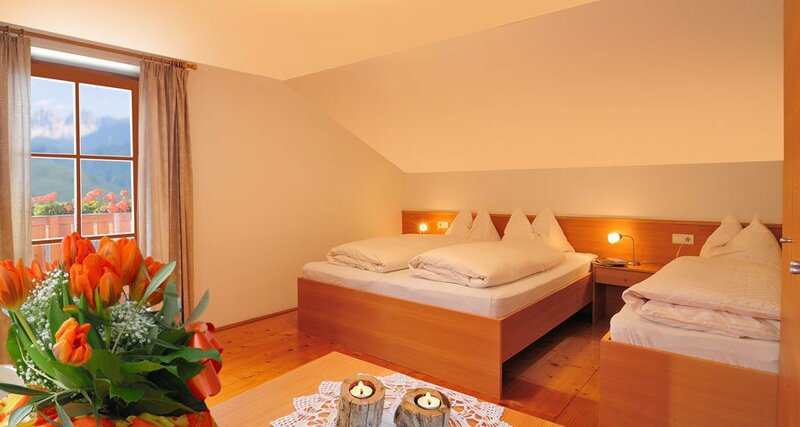 Our guest room Langkofel is approx. 28 m² in size. The prices are per day, for a minimum stay of 5 days in our apartments. For shorter stays in our apartments, we charge an extra fee of 25.00 € to 35.00 € for the final cleaning. As of 01.01.2018, we are required to collect a local tourist tax of 1.55 € per person and night for all guests older than 14 years. Bread delivery service, and all other fees and taxes. For each additional person staying in the holiday apartment, you pay 5–10 € per day (kids up to 2 years are free of charge). On request, we also provide a cot, a high chair, and a baby phone. We welcome written reservations via e-mail. The reservation will be confirmed once a deposit has been paid. We ask for your understanding that the deposit cannot be refunded in case of cancellation. The below stated cancellation policy will apply.  We accept following payment methods: Cash payment up to 2,999.99 Euro, pre-payment via bank transfer, non-transferable check. Since January 1, 2016, in Italy it is no longer allowed to pay amounts above € 2,999.99 in cash. On arrival day, the apartment or guestroom is ready for you starting from 2pm, earlier only upon request and availability. On departure day, please leave your room latest at 10am, later only upon request and availability. You may cancel your reservation until 30 days prior to your arrival without paying any cancellation fee. For cancellations less than 30 days before arrival: 60% of the agreed total price. In case of failure to make use of the booked apartment for the agreed period without a cancellation, you are required to pay 80% of the agreed total price. In case of early departure, you must pay the price for the used days and 80% of the agreed price for the remaining but unused services. 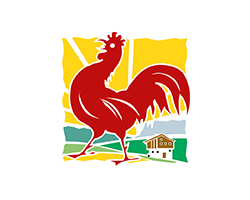 In order to save on these fees, we recommend the travel insurance “Red Rooster” – This way the European Travel Insurance will pay them for you. Mandatory information according to EU Regulation No. 524/2013 of the European Parliament and Council. For the purposes of the GDPR, we inform you that your data will be used and saved exclusively for processing your application and will not be disclosed or distributed to third parties. Regarding data processing, you are entitled to all rights according to the GDPR. The holder of the rights is Konrad Eisenstecken – For more information about your rights, please visit here.